Every Client will be asked to read and sign Woofy Wagon Policy Agreement prior to any grooming services being performed. Client hereby entrusts pet(s) to Woofy Wagon (noted as Woofy Wagon hereafter) for the purpose of grooming services. Payment is due at time of service. Woofy Wagon accepts cash, check or card. Checks returned NSF WILL incur a fee of $25, plus any fee my bank may charge. No further service will be provided until fee is paid. On rare occasions, Woofy Wagon may need to cancel your appointment due to equipment failure, weather, illness, etc. Every effort will be made to contact Client in advance to reschedule. If Client cannot keep their appointment, please contact us AT LEAST 24 hours in advance. Failure to call 24 hours before your appointment or failure to have your pet available at the scheduled time WILL result in a charge of $50, which must be paid within 7 business days. All scheduled multiple pet clients, who may decide not to groom one of their pets at the last moment, WILL be responsible for part or all of that pets grooming charge. There will be a $50 trip fee for missed scheduled appointments, which must be paid within 7 business days. Ultimately it is Clients responsibility to keep track of their scheduled appointments, however Woofy Wagon will make a courtesy phone call one-business day ahead to confirm and remind you. If you are a first time Client and you are a no show when groomer arrives for your scheduled appointment, Woofy Wagon will not schedule any future appointments. An appointment time is truly an ‘estimated time of arrival’. Arrival time will be in a 1-2 hour time span. As a mobile service, our schedule is subject to interruptions and delays, such as, but not limited to: Refueling, traffic, driving distance from previous appointment and running over on a previous appointment. If Woofy Wagon feels they will be more than 15 minutes early or late, Woofy Wagon may call ahead. Woofy Wagon offers a ‘key on file service’. 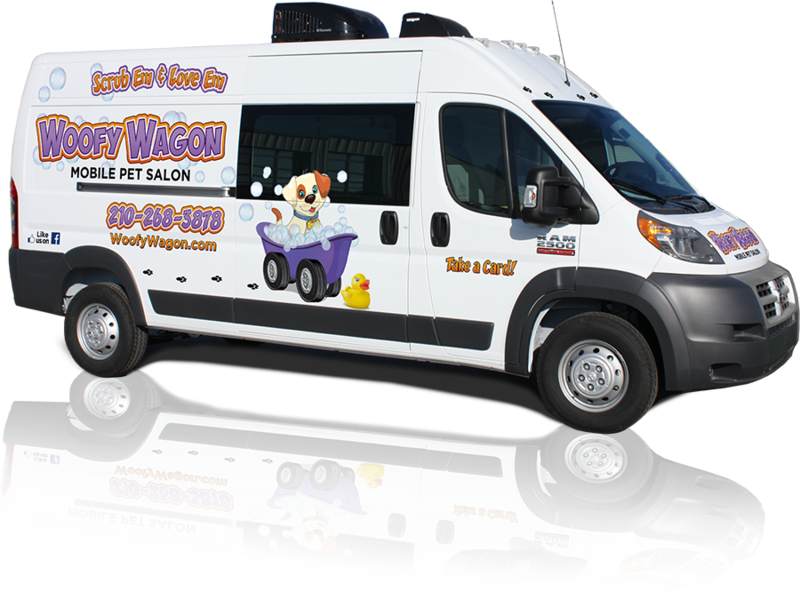 Client provides Woofy Wagon with a key to keep on file, a garage code, or some other form of access to the home, Woofy Wagon will come by at your scheduled grooming appointment time to care for your pet and Client just leaves a form of payment. Woofy Wagon will not be held responsible for damages or theft to Clients home or property while on the service call for grooming your pet(s). Excessive de-matting is a painful, time-consuming and costly procedure that causes extreme discomfort and can aggravate, or cause skin problems. Client is aware that neglect of the pet’s coat can be cause for problems after grooming such as clipper/brush irritation. If Client’s pet does not remain still accidents can happen such as, cuts, nicks, etc. from clippers or scissors. However, it is at Woofy Wagon discretion to determine if it is safe for the pet to be de-matted, if not, a “shave-down “of the pets coat will be completed. Shaving your pet my dramatically change your pet’s appearance and the hair will be very close to the skin. This may expose pre-existing skin conditions. Client’s pet will receive a shave down & start over (additional fee for shave down.) Closely shaved pets are also prone to sunburn & should either have sun screen applied daily or should be kept out of the sun until the hair grows sufficiently to protect the skin. In some cases pets may also exhibit brief behavioral changes. In certain breeds & coat types, the coat may not grow back the same. Removing a heavily matted coat includes the risk of nicks, cuts and/or abrasions due to moles, warts or skin folds trapped in the mats. Heavy matting can also trap moisture near the pet’s skin which can cause mold, fungus, bacteria or skin irritations that exist prior to the grooming process. The after-effects of mat removal procedures may include itchiness, skin redness, self-inflicted irritations or abrasions, or failure of hair to re-grow. Client is responsible for the condition of the pet’s coat and will not hold Woofy Wagon responsible in the event of adverse effects of mat removal. Your pets safety is first at Woofy Wagon. We require a current rabies vaccination expiration date before any grooming services will be performed. Proof of Rabies Vaccination shall be provided to Woofy Wagon upon request as well as current Veterinarian information. Client must inform us prior to grooming if your pet has bitten someone or has aggressive tendencies. Woofy Wagon will not accept any aggressive dog. If false accusations about the pets behavior were made when asked during booking of an appointment, we will discontinue services and Client will still be responsible for the full grooming charge. Client will be liable for any bites or any property damage caused by their pet(s). For Groomer’s safety as well as your pets, Woofy Wagon has the right to refuse service in the event of a pet that cannot be handled safely. FOR OVERLY AGGRESSIVE OR OVERLY STRESSED PETS, Woofy Wagon WILL NOT BE ABLE TO MAINTAIN YOU AS A CLIENT. Grooming procedures sometimes can be stressful, especially for a senior pet or a pet with health problems. Because senior pets and pets with health problems have a greater chance of injury, these pets will be groomed for cleanliness and comfort, in styles that will not add to their stress. Woofy Wagon will not be responsible for accident or injury to an elderly or health-compromised pet during their grooming. Flea and tick infestation will NOT be tolerated. Client is responsible for keeping their pet(s) flea and tick free. If a flea or tick is found on your pet, Woofy Wagon will administer a flea and tick shampoo to eradicate the fleas in order to maintain salon sanitation. If Woofy Wagon finds an infestation of fleas or ticks on a pet, and an additional $75 de-bug cleaning fee will be added in addition to the groom fee for this service. There may be side effects, including, but not limited to allergic reactions, which may result from the manufacturer-recommended usage of said products, which Client agrees that Woofy Wagon will not be held responsible for. Additionally, Client is also aware that any such treatments are not guaranteed to be one hundred (100%) effective. Occasionally, grooming can expose a hidden medical problem or aggravate a current one. This can occur during or after grooming and may require immediate medical attention. In the best interest of your pet, Client designates Woofy Wagon, as agent and understands that if Woofy Wagon is unable to contact Client first, then Woofy Wagon, in its sole discretion, may engage the services of a veterinarian at Clients expense. Client consents that Woofy Wagon may take pictures of your pet, before and after grooming, and utilize the same for their website, social media for any and all and/or advertising purposes at Woofy Wagon discretion.Client affirms they are the rightful legal owner, or care giver to the pet for which services are rendered. I, the undersigned, understand and agree to the above terms for the grooming and maintenance of my pet(s). In consideration of the grooming services, I agree to hold Woofy Wagon harmless from any and all damage, loss, or claims to pet, personal or real property. I acknowledge that thee interpretation of this provision is to be read in the broadest since possible and encompasses any real or proceeded negligence and all acts performed reasonable within the scope of service by Woofy Wagon, its agents, its employees or representatives. The terms, special services or handling shall include but are not limited to emergency veterinarian services in the event I am not available. I authorize Woofy Wagon and/or agent thereof to act as my agent in the event emergency veterinarian services, boarding, care-taking, and/or transportation is necessary and agrees to pay all costs. Any/all damages, loss or claim shall include, but not be limited to death, injury, or shock. Said pre-existing conditions shall include, but not be limited to advanced age, extreme nervousness, neurosis, illness, previous injury, skin or coat conditions, or medical conditions. I, the undersigned, have read, understand and agree to the above terms and my rights and obligations for grooming and maintenance as stated in the agreement for the services of pet grooming through Woofy Wagon.